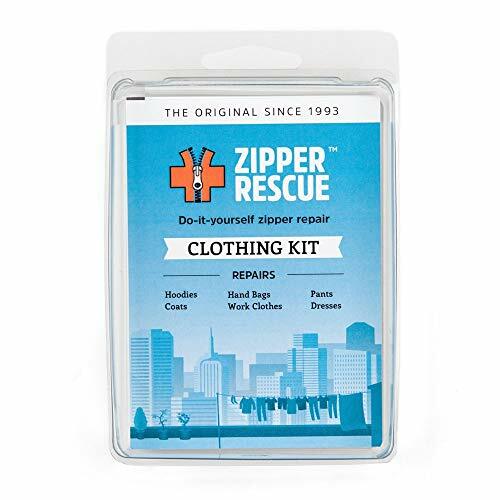 TIME TESTED - The Original Zipper Rescue Kit, created in 1993, began a legacy of do-it-yourself zipper repair, which we are proud to continue today. We provide you with parts and knowledge at an affordable price while you learn a new, life-long skill. WHY ZIPPERS BREAK- Most zippers fail because the slider (small part that slides up and down) wears out, falls off, or breaks. If the zipper is not missing teeth or mangled, simply replace the slider and you re all set! KIT SPECIFICATIONS - The Clothing Kit allows for repairs on plastic tooth (Vislon), metal tooth, and nylon coil type zippers. What happens when the zipper on your favorite jacket breaks and is rendered useless? With our Zipper Rescue Kit on hand, you can repair it in minutes and bring your jacket back to life. MANUFACTURED IN USA - Products assembled in Portland, OR, USA. Parts manufactured in USA & Japan. Parts Included: 2x - 3 Coil - Sliver 2x - 5 Coil - Black 2x - 4.5 Metal Tooth - Brass 2x - 5 Metal Tooth - Antique Brass 1x - 3 Plastic Tooth - Black 2x - 5 Plastic Tooth Sliders - Black 6x - Top Stops - Black and Gold 4x - Bottom Stops - Gold Please Note: - Missing or visibly damaged teeth on zippers cannot be repaired. - Does not repair box and pin mechanism at the bottom of jacket zippers. Unfortunately, this part cannot be repaired if it is missing or damaged. We have tried many times and do not want to waste your time or give false hopes. - If your size is not included with this kit, please contact us and we will be happy to assist you. 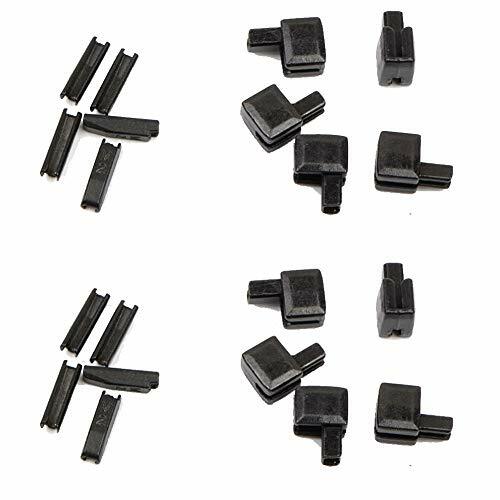 EVERYTHING YOU NEED - Comes with 11 quality replacement sliders commonly used with clothing and accessories. Also comes with 4 bottom stops and 6 top stops. 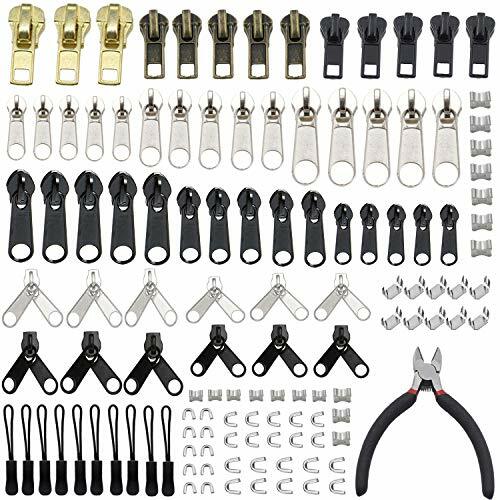 ULTIMATE DIY ZIPPER FIXER - The Clothing Kit repairs worn out or broken sliders on plastic tooth (Vislon), metal tooth and nylon coil-type zippers. Repairs can be done using most standard pliers. VERSATILE ZIPPER REPAIR KIT - Provides replacement parts zipper repair on clothing and accessories such as jeans, skirts and slacks, purses, sweatshirts, jackets, etc. WHY WE ARE DIFFERENT - As a small family business, our dedication to outstanding customer service and high quality parts is unmatched. This is no average zipper repair kit. ADDITIONAL RESOURCES - Includes illustrated instruction manual filled with information on repairs and useful tips, and contact info for helpful customer service and hard-to-find parts. MADE IN USA - Our kits are assembled in house in Portland Oregon, using high quality parts made in USA and Japan. 1.Check the zippers size carefully before buying. The product is strong, durable and good quality,We attach great importance to every production link,If you are not 100% completely satisfied with your order, simply let us know and you will be offered a full refund or replacement,It is impossible to address issues if we do not know about them! deep green, deep brown and black. These nylon zippers performed good even open and close frequently. Suit for making or fixing slacks, skirts and dresses, bags, pet clothes, pouches and other craft projects. 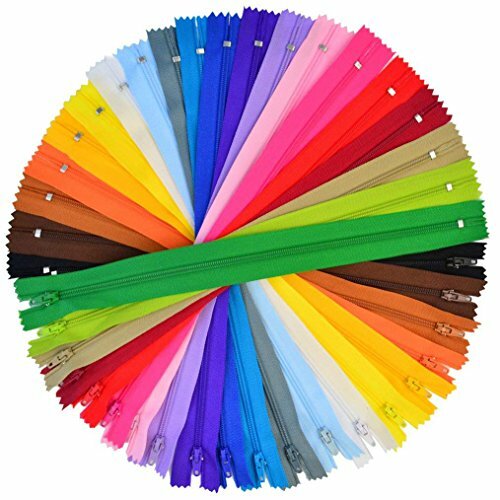 These zippers are very nice and the color assortment is very usable, will be popular and utility in kid's craft classes. 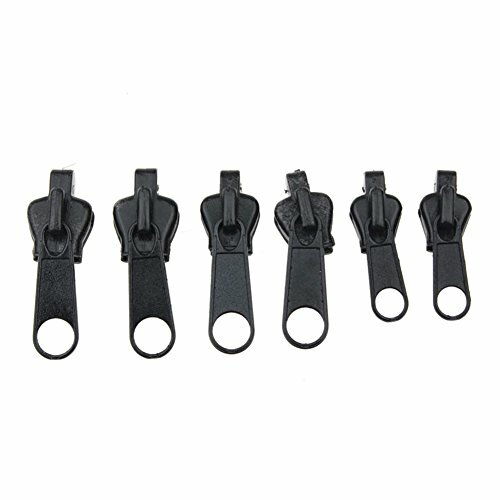 If you are satisfied with our products, please press the " Add to Cart " button and buy our Nylon Coil Zippers. ASSORTED COLORS: Include yellow, golden yellow, orange, red, wine red, sky blue, white, pink, light purple, rose red, deep purple, royalblue, light blue, light brown, grey, beige, light green, deep green, deep brown and black. PREMIUM MATERIAL: Our nylon coil zippers are made of good quality nylon, thicker zippers cloth and good quality metal zippers head, which is durable and sturdy to use. Suitable for casual pants, shirts, jacket pockets and like. WIDE APLLICATION: These nylon zippers can be used for costume designing, pillow cases, boutique accessories or other handicraft, also can be applied for fixing or sewing slacks, skirts and dresses, bags, pet clothes. Unique design works on virtually all zipper types. It works on small and big zippers (max. 9 mm wide) even on invisible zippers. Zip up your favorite dress with ease. Zip up your boots. Kids can also use Zipuller to zip up dresses by themselves. Make closing/opening of hard to reach zipper easier and faster. Zipuller was designed to work with zipper pull handles that are 9 mm wide or narrower. 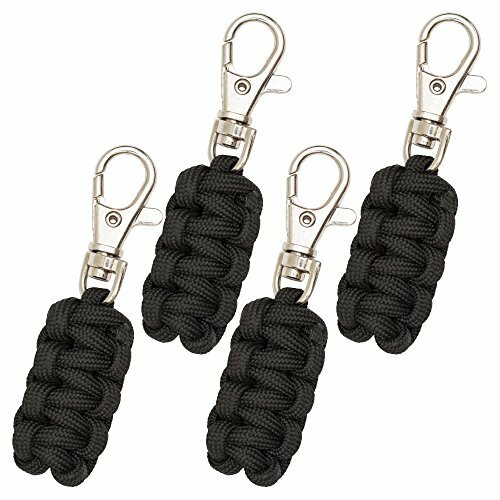 Paracord zipper pulls are great for emergencies and they offer a cool stylish look as well. In an emergency situation the paracord can be unraveled to approx. 7.2 feet (each zipper pull contains about 1.8 feet of paracord) and used as a close line, rope, snare, tripwire or for anything you'd need rope for. Our zipper pulls have a smaller metal hook than many brands you'll find. This allows these to be hooked onto almost any zipper unlike the models with thicker hooks. The inner strands can also be pulled out and used as fishing line or tinder to start an emergency fire easily. Note: Only untie these in an emergency situation. Once untied they should not be reassembled by anyone who is not a skilled paracord technician. Size Approx: 3 in. x 1 in (includes metal loop). Amazing survival tool that can be unraveled to 7.2 feet of paracord (Approx: 1.8 feet unraveled each) in an emergency situation. 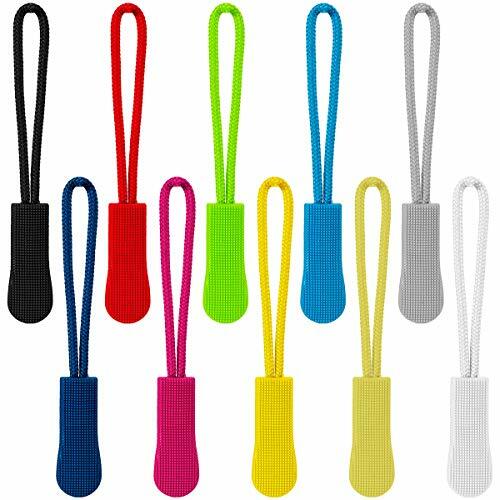 Use these paracord zipper pulls for backpacks, tents, jackets, pants, boots, duffle bag or really anything that has a zipper! Attaches to almost any zipper. The metal loop is small enough to get into nearly any zipper. Many other zipper pulls on the market are too thick for this. 30 day money back guarantee. We'll take it back with no-questions asked - guaranteed! 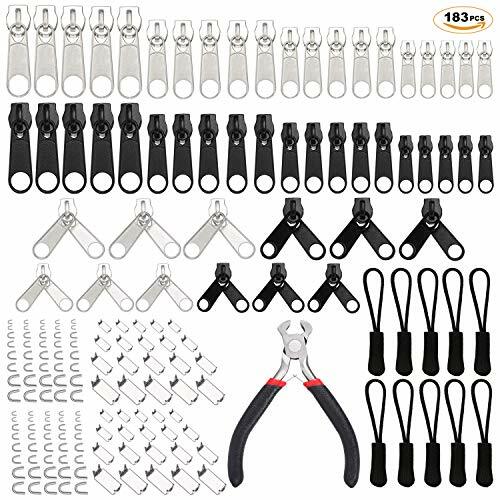 EuTengHao 183 Pieces Zipper Replacement Zipper Pull Zipper Repair Kit with Install Pliers Tool for Clothing Jackets Purses Luggage Backpacks. 10 x bottom stoppers (3#, 5#, 8#, 10#). 20 x top stoppers (3#, 5#, 8#, 10#). 10 x zipper extension pulls. Step 1: Take off the top of the zipper tape, remove the unusable zipper slider. Step 2: Take correct type of new slider in the right direction and fix it on the zipper tape start from tape bottom, make sure teeth are matching of both side right and left. Step 3: Fix the bottom stops on the tape. Please distinguish front and back,the square side should be the front side. Best position, covering the bottom of a chain. The bottom of the plug bite teeth, durable, elegant appearance. Step 4:Make the top stops on the tape up 1mm away from the teeth to ensure the appearance and firmness. Step 5:Please move the slider up and bottom to test the function after finish above 4 steps,polish zipper teeth with wax or spray to make zippers smoother and move easily. Note: Please confirm your zipper size and type before you buy. All things in the package are small part, please keep away from children. Good quality: Made of high-strength metal, superb electroplating process, not easy to fade. 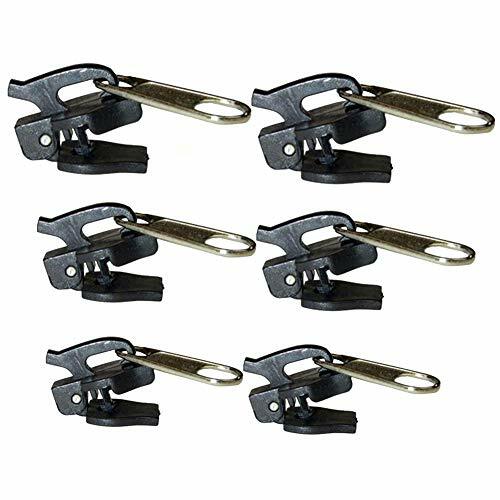 Extensive use: provides frequently-used applied replacement sliders in many sizes for the repairing of bags,clothing,coats, outdoor tents, jackets, purses, jeans, backpacks, luggage, and some DIY project. How to do it: 1>Remove top zipper stop. You can use the pliers tool to do that. 2>Remove the old slider. 3>Put the new slider on. 4>Then use the pliers tool to press zipper stop back into place. Notice: This zipper repair kit prefer use sliders for nylon coil zippers, baggage and suitcase, home textiles, costume designing, pillow cases, boutique accessories, costume design, kids clothing, bags accessories, costume decorations or other handicraft. Do not recommend used to heavy jacket. Please make sure the size and type you need before you want buy it. And please keep all things away from children. 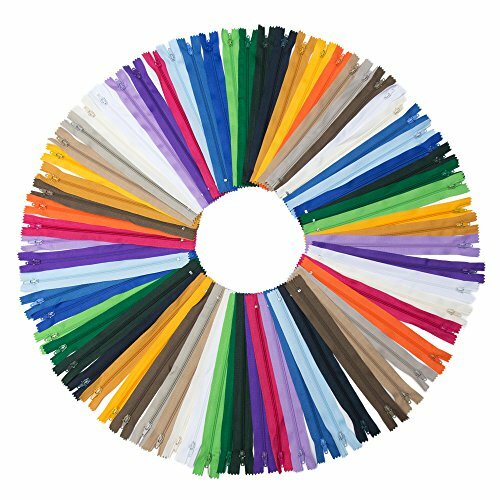 These zippers are very nice and the color assortment is very usable, means they are very suitable for craft use. 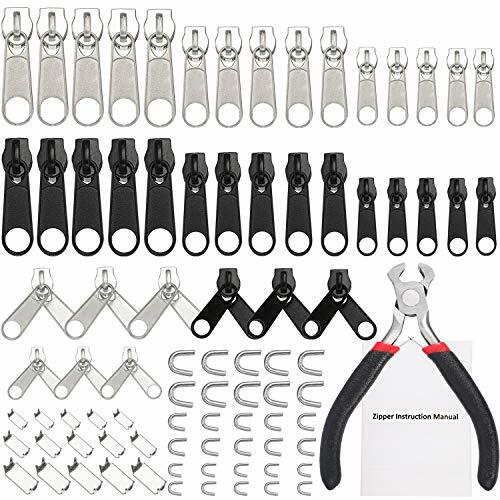 The 85 pieces zipper repair kit with the most common size zippers and accessories, good for jeans, jackets, coats, skirts and slacks, can resolve your most of the zipper replacement needs. 1. Firstly, take off the metal stops on the top of the zipper tape, both side of metal stops should be taken off. 2. Move the slider to the top of the zipper tape, align the zipper teeth. 3. Install the slider into the zipper tape: make the left hand seize both side zipper tape, use your right hand to pull the slider down into the zipper teeth. 4. If you are tough to pull the slider into zipper teeth, you can use some wax or spay some oil to polish the zipper teeth to make it easier. 1. Please confirm your zipper size and type before you buy. 2. Small parts, please keep them away from children. Suitable for mending backpacks, jackets, purses, duffle bags, etc. Easy to install zippers in just seconds without using tools. Zipper tabs in easy-to-grip shape are strong when in place. Big eye on the tab for you to attach things like luggage tags, lock, lucky charms, etc. Easy to install in just seconds without using any tools. First, slide the metal locking pin through the eyelet on the zipper. Then plug it into the 2 holes on the plastic tab, and push it in until it locks. Suitable for bags, clothes, suitcases, etc. 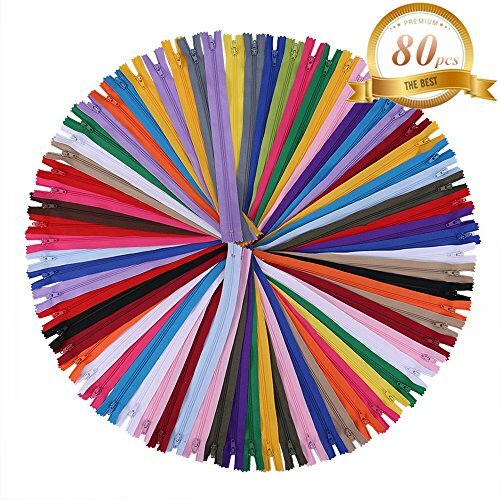 -Assorted Color Zippers Bulk: Perfect for costume design, clothing, pillow cases, purse, boutique accessories or other handicraft. -Size: Total length - 17.3 inches (44cm), teeth length - 16 inches(40.5cm). -If you have any problem with our products, please contact us by email. We will reply to you as soon as possible! 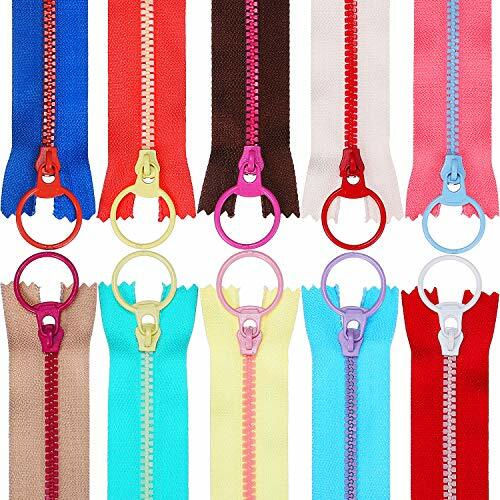 ZIPPERS BULK - Comes with totally 80 pcs assorted color nylon zippers. Enough for your daily family or craft use. SIZE - Teeth length is about 16 inches (40.5cm), full length is about 17.3 inches (44cm). HIGH QUALITY - The zipper's teeth are made of nylon, practical and durable. Slider can work smoothly between the teeth. MULTIPURPOSE - These nylon zippers can be used for costume designing, clothing, pillow cases, boutique accessories or other handicraft. Description: - Brand new and high quality. - Simple design and easy to use. - Fits for jeans, skirts and slacks, purses, sweatshirts and jackets, etc. - Can save you time and money, ensure you can repair those favourite items with ease. - Containing a variety sizes of zips you are sure to find the perfect match to carry out a repair. Specification: - Material: Alloy - l Nylon zipper: Approx. 2x8mm / 0.08x0.31inch - M Nylon zipper: Approx. 2x5mm / 0.08x0.20inch - S Nylon zipper: Approx. 2x3mm / 0.08x0.12inch - Color: Black/Coffee Package Includes: 6 Pieces Zipper Puller Note: Due to lighting effects, monitor's brightness , contrast settings etc, there could be some slight differences in the color tone of the pictures and the actual item. Please allow 1-2mm differs due to manual measurement, thanks. DURABLE & PRACTICAL - Universal Sizes. Works on most common zipper mishaps including split zipper tracks, broken sliders and up to 3 missing teeth. It fits for jeans, skirts, golf duffle bags, sleeping bags, purses, jackets, suitcases, tents, etc. A VARIETY SIZES OF ZIPS - Containing a variety sizes of zips you are sure to find the perfect match to carry out a repair. SAFE MATERIALS - Made of nylon plastic and stainless Steel. BPA free and free from any other harmful and toxic chemicals. MODERN DESIGN - Can be started in the middle of a zipper, zips forward and backwards. Easy to install. No tools required. 6 Packs 3 Sizes: 2 x Small, 2 x Medium, 2 x Large. 100% MONEY BACK GUARANTEE - If you don't like the product. Please Contact us at anytime. We'll full refund to you. Length: 9.4 inch in full-length and about 7.7 inch from bottom to the top of the zipper. Colors: 20 colors, each color 5 pieces. Colors are as follows: coffee, white, beige, golden yellow, claret, black, light green, army green, light pink, light purple, orange, blue, hot pink, bright red, purple, green, light blue, yellow, Red brown, light grey. 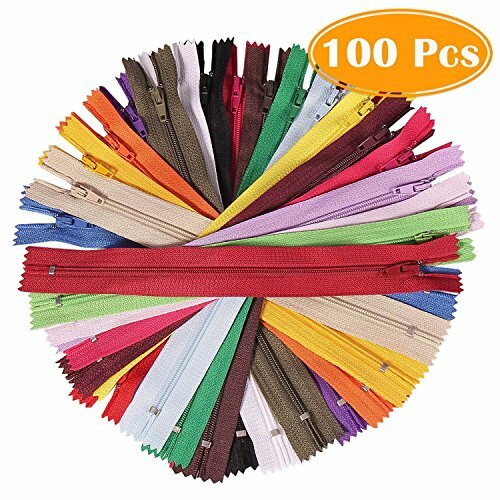 100 pieces mixed color zippers. SIZE - All the zippers are about 9.4 in full-length and about 7.7 from bottom to the top of the zipper. These nylon zippers performed good even open and close frequently, suitable for sewing, making or fixing clothing, bags, pet clothing, pouches, wristlets, and other craft projects. --Colors: 25 colors, each color 2 pieces. Colors are as follows: coffee, white, beige, golden yellow, claret, black, light green, army green, light pink, light purple, orange, blue, hot pink, bright red, purple, green, light blue, yellow, Red brown, light grey. If you have any problem of our zippers, you can click "seller contact" button in your Amazon account to email us. we would be delighted to reply as soon as we can. Please make sure your zipper type and size before purchase. Keep these small pieces away from children. WIDE APPLICATION: Fit for tents, suitcases, clothing,sleeping bags, purses, boots, and much more. USE: For jeans, pants, coats, and more, you'll love the ability to fix your own clothes with ease, and without a costly trip to the tailor. APPLICATION: Most repairs can be done with pliers or small wire cutters. 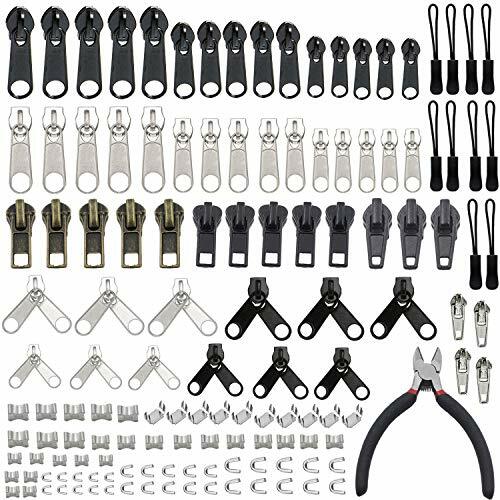 Sliders and stops within kit are assorted in weight and type to accommodate most repair needs. DESIGN: Fix split zipper tracks, broken sliders, & up to 3 missing zipper teeth with this easy to use. Made of high quality metal without rust. Zipper repair Sewing Tools,hand bag zipper sliders,Clothes zipper replacement. Size: #5, used for #5 zippers.Can be used to metal zipper and nylon zipper. Quantity: Totally 20pcs as picture shows. Using:Clothing, Jackets, Backpacks, Luggage, Purses, Handbags, etc. 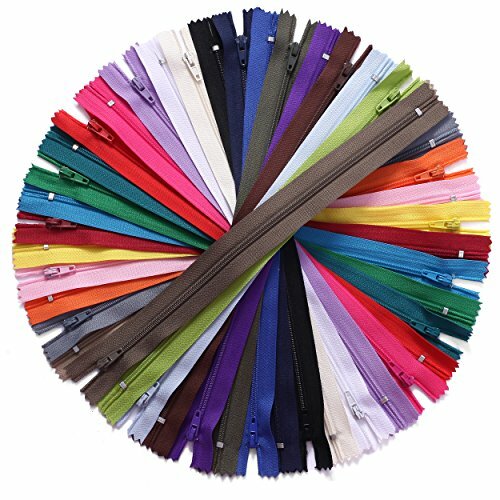 Colorful zipper pulls meet all your needs.10 colors including black, white, dark red, blue, navy blue, green, yellow, beige, grey and pink. Match colors according to different items. PVC material provides high quality and long service life. The maximum pulling force is about 15 pounds which is non-deforming. It is widely used on any accessories. Easy to attach the zippers to add length or apply as a replacemant for the broken zipper. 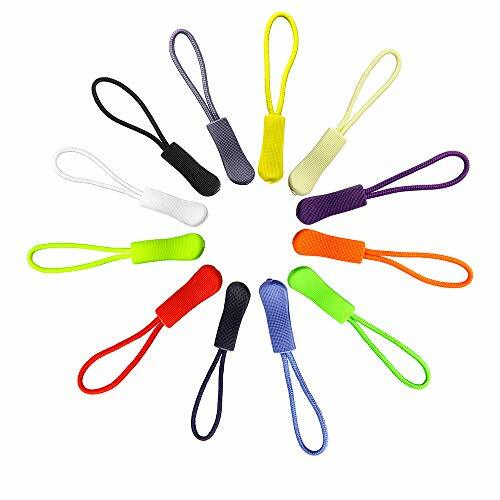 Pecfect for your backpacks, bags, jackets, sportswear, travel packages, purses or even hang it on your mobile phone and keys. Very useful and handy in your daily life! 100 pieces, 10 colors: 100 pcs in a pack, including 10 colors*10 psc per color. (Black, white, dark red, blue, navy blue, green, yellow, beige, grey, pink) Meet the needs for all your items. Absolutely no color difference: the color is exactly like what is shown in the pictures. Sturdy Material: designed with extremely durable and long-life pvc, which make sure the pulls are anti-friction, anti-corrosion, anti-heat. Application: It is easy to attach all kind of zippers or replace the zippers. Also widely suitable for backpacks, sportswear, travel packages, luggages, bags, tents, purses, etc. Non-slip design zipper head: curves and rough surface will fit your fingers well. Can even pull the zipper with gloves. 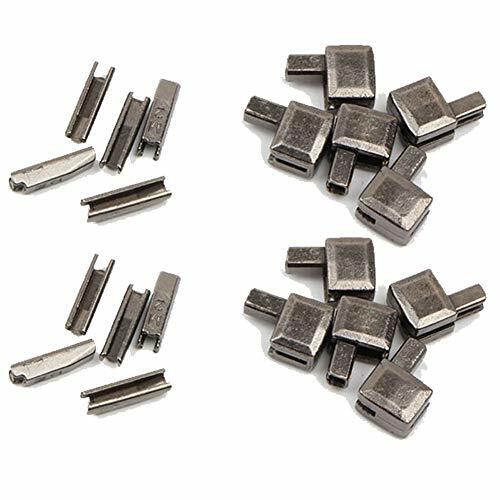 Our ziper fixer tags are made of high quality zinc alloy, sturday and durable, will not to fade or break easily, can provide you a long service life. Take needle nose pliers to spread the clasp open, attached it to the zipper, and then closed the clasp. This zip fixer can be used in clothes, backpack, suitcase, gym bags, coat, jacker, purses and much more. 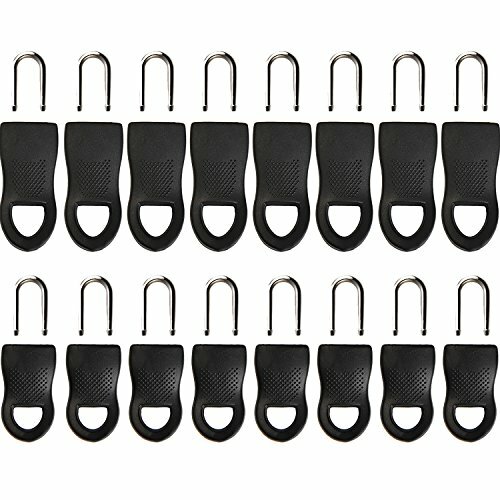 Zipper Pull Replacement - These zipper tabs are reusable and dismountable, good replacement for broken zippers, suitable for backpacks, travel suitcases, luggage, gym bags, coat, boots, jacket, sportswear, purse and much more. Premium Material - The zipper pulls are made of high quality zinc alloy, the surface is smooth and polished, sturdy and durable, will not to fade or break easily, can provide you a long service life. 4 Color & 2 Size - Our zipper tabs have 4 colors and 2 sizes, light gold, gun black, steel color and silvery. 2 Sizes is #3 and #5, #5 measures 0.47 x 1.6 inch, #3 measures 0.35 x 1.14 inch. Easy to Replace - Take needle nose pliers to spread the clasp open, attached it to the zipper, and then closed the clasp. Quantity - 16 pieces zipper fixer replacement in total, includes 8pcs #3 (0.35 x 1.14 inch ) zipper fixer and 8pcs #5 ( 0.47 x 1.6 inch ) zipper fixer in 2 sizes and 4 colors, 4 pcs of each size and color. Note: small parts, not suitable for children under 3 years old. Convenient to use attaches very easlly onto virtually every zipper. Can be used as a replacement for zipper or attached to zipper for added length. 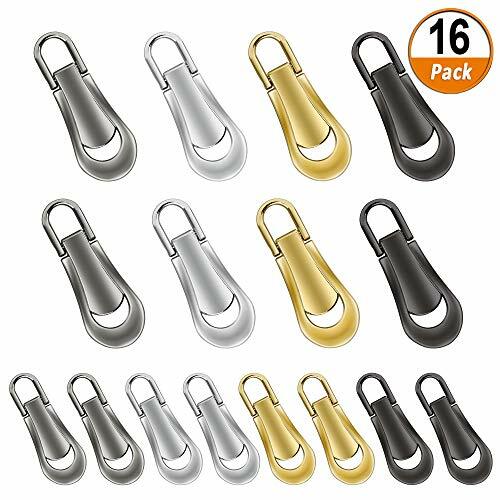 Widely used This zipper extension pull suitable for backpack, bags, travel packages, jackets, garments, sportswear, and also can hang them on key rings, purses, etc.